Fort Rock is another one of my favorite places to visit, and one that I like to go to annually – rather like taking a pilgrimage, I suppose. And what better way to describe the fascination this place can have on a person other than something spiritual? 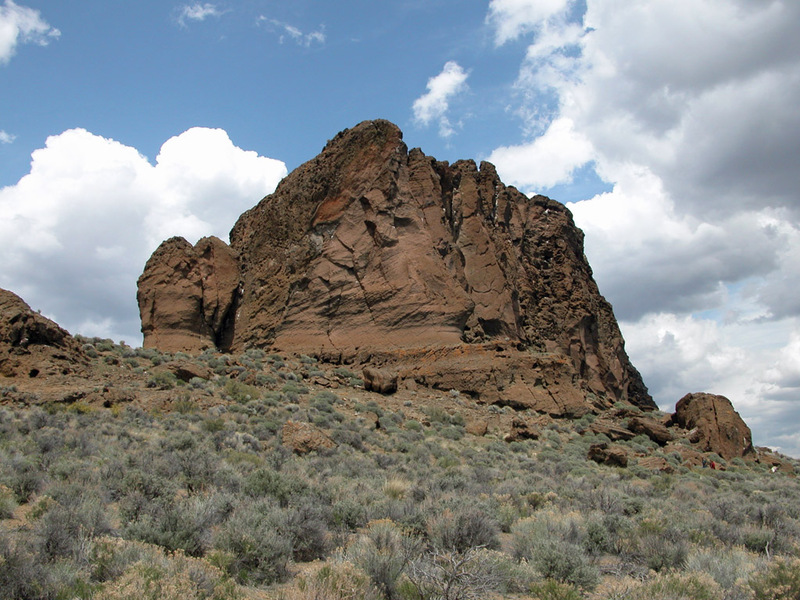 Maybe that sounds a bit strange, but whether you’re a roadside geologist or just someone who loves Oregon landscapes, in order to truly understand Fort Rock you have to visit it for yourself. Fort Rock is a big, old, dried up volcano and to look at photos of the structure taken back in 1911 you’ll realize that it hasn’t changed much over time. Getting there is not difficult but it does require some drive time. The turn-off is from Hwy 97 (the Fremont Hwy 31) at La Pine (view map here) – it’s about 27 miles east from the junction. 1911 Ft. Rock Library of Congress Photo - It really hasn't changed much. Fort Rock is simply out in the middle nowhere, in the land of open fields and farmland. It appears as a low hump out on the horizon as you drive towards it, but the closer you get, the larger it becomes. The actual lava formation is somewhere between 50-100,000 years old depending on which geological source your read, and from the wear on the rocky structure, it looks at least that old. 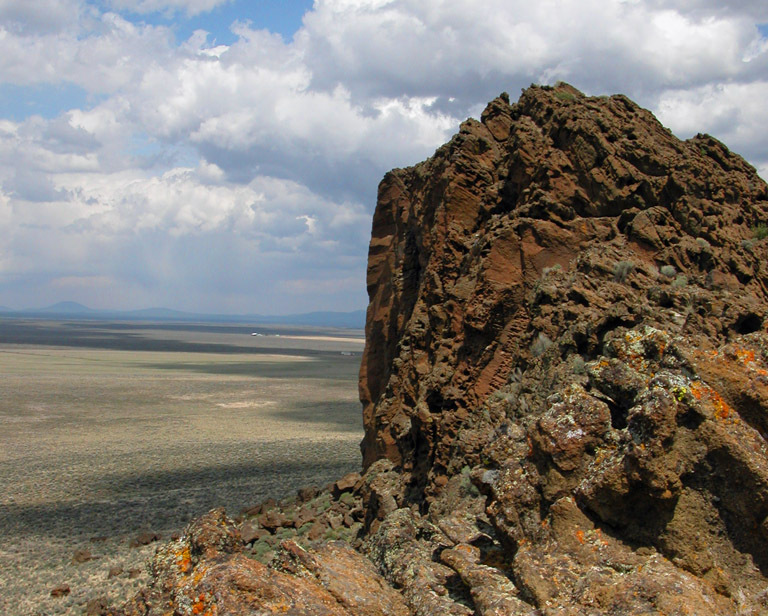 If you can just imagine 900 miles of lakes, 150 ft. deep surrounding the currently arid landscape of Ft. Rock, you’ll get an idea of how much the terrain has changed since this volcano tuft was born. The Rocky Structure of Ft. Rock (people at lower right of the rock gives proper perspective. As you drive up to the Ft. Rock parking lot (complete with picnic area and nice restrooms) Ft. Rock starts to look pretty big as it juts out of the ground 325 feet into the sky. There are several hiking and walking trails into and around the extinct volcano, and they’re all worth taking in. It’s pretty much mandatory in my mind that you walk into the center of the structure and plan to stay awhile, even just a short while. There’s a calmness at the center that just can’t be explained – but is certainly felt once you get there. I don’t think I’m the only one who feels this way either, due to the fact that a number of ceremonial fireplaces usually dot the trail into the hollow center of the structure. Several trails lead into and up to the rim where you can get a good view of the surrounding flatlands. What you’ll see: Hikers and hiker-dogs, volcano and geologic enthusiasts, tourists and a camp host in the summertime. There is usually quite a bit of wildlife at Fort Rock including pigeons, birds of prey, and commonly prairie falcon as well as antelope and smaller ground animals such as jackrabbits and squirrels and an assortment of lizards. If you plan a trip to Ft. Rock you can fill up your day by scheduling a tour of the local Ft. Rock Cave open April 1 to Nov. 1, but you need to make reservations in order to take that in. There is also the Crack in the Ground which is nearby and certainly worth touring if you want to make a full day of adventure. Indeed! I’m sure cold and windy early in the year. Hot and toasty during the summer! It’s all part of the charm of the place. Thanks for reading my article!